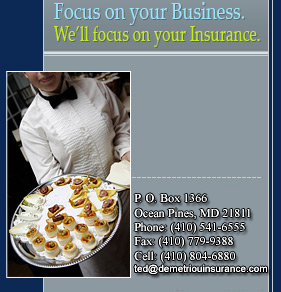 Demetriou Insurance Services, Inc., located in Ocean Pines, Maryland, is a full-service, independent, property/casualty agency. As independent, we work for you, the insurance consumer. Our job is to shop your needs (pricing as well as coverages) to the various insurance companies and come back to you with suggestions regarding your policies. We do not stop there, however. We are at your disposal when you need us, whether by telephone, internet, email, fax or cell phone. In fact, although a particular circumstance may lead to an unanswered call, Mr. Demetriou’s cell phone is never away from him. The insurance marketplace is ever-changing. Demetriou Insurance Services is responsible for keeping up with those changes. You, as our client, need only keep in touch with us. We will do the work, year after year, to ensure that you have the right coverage for the right price with the right company. You do not need to shop your coverage every year. Our focus will always be on keeping you covered in the best way and the most economically. Demetriou Insurance Services takes great pride in communicating with you as often as necessary. When you leave a message, we strive to return the call before the end of the day. Additionally, we do no limit our searches to local markets. With access to all of the modern-pay vehicles for communication, we have found coverage for our clients through companies located all over the United States and Europe (mostly London markets). As long as the company is strong, viable and well-rated, we will search it out in order to find the best thing for our clients.